I'm planning to paint my new conical nasal helmet, but I'm wondering how to best go about it, and how to best protect my helmet from rust. I was thinking to sandpaper the hemlet to make it rougher and then apply some kind of primer (what kind?). Then, paint it using modern acryllic paint and finish it with some matt varnish. I'm wondering how chip-resistant the end result will be. I'm bound to get hit on the head with steel swords quite a bit. I'm worried that it will chip and that the steel under the scratches will begin to rust. I'm not sure I can/should oil my helmet after painting and varnishing it. Anyone have experiences with painted helmets, chipping from steel swords and rust protection? Thanks in advance! there was a post not long ago where another gentleman was painting his armour - i think he was going for a little more or a history approach to it and basically used true artist oil based paints and pigments. if your not worried about making it the old fashioned why, the easiest paint and primer i would know to use is Rust-o-uilm. they make a primer (brown in color) that seals rust to prevent it from spreading, and they have a range of colors to chose from, and it's all oil based. the paint is very easy to apply and have a drying time of a day or two - about a week to cure. nasty rust, its as if noting stops it once it starts, the preventive primer with this product it does seem to spot rust from spreading, but not digging into where it already is. there is an automotive product claimed to seal rush completely, but i've never used it. my philosophy is once rust begins - you just have to manage it, unless you what to do some surgery and scratch or buff it out. but i don't think theirs any paint out there that can save you from getting a chip if chopped in the head. there are teflon based clear coats in automotive paints, but just 1 pint of it can run a lot of money, and even though it is tuffer, i really don't know if it would be worth the expense. besides it's still going to chip or show a cut, its just a little more durable. paint, it is a better way to protect your metal, but as paint ages it gets more and more porous. so you may have your seel totally covered - but if it's in a bad environment, the oxidation is still there under the surface and will eventually bubble up and flake off. but that's if you don't care for it. if you touch up you paint (just like you would your car before you wax it for the year) it should last you a long time. Clean the surface really well so there are no traces of grease, dirt or rust. A rotating steelbrush in your drilling machine works fine enough to get the rust off. Then paint it with really thin layers of linseed based oil paint. Make sure to only use real linseed oil and good pigments. Do this right and it will stick for years. Just make sure you paint really really thin layers. A small dip of the brush is enough for the first coat (white first if you're using a light colour later) and then work it out over as large area as you can. Repeat as needed. It's important that you let the paint dry well between the layers otherwise you'll get a thick layer that will take ages to dry completely. Oil paint from linseed oil will eventually harden and when it does it's basically waterproof. Here's the stuff you want! Good luck and we sure hope to see the result here when it's done! I live in an old farm house that was built on a spring so moisture has been an ongoing problem for me for years. One method I have used when dealing with rust removal is bead blasting. You must be very careful to use the correct medium or you will remove a large amount of metal when you do it. The advantage is that the bead blast will remove all the rust from the metal and leave you a satin finish that paint adheres to very well. 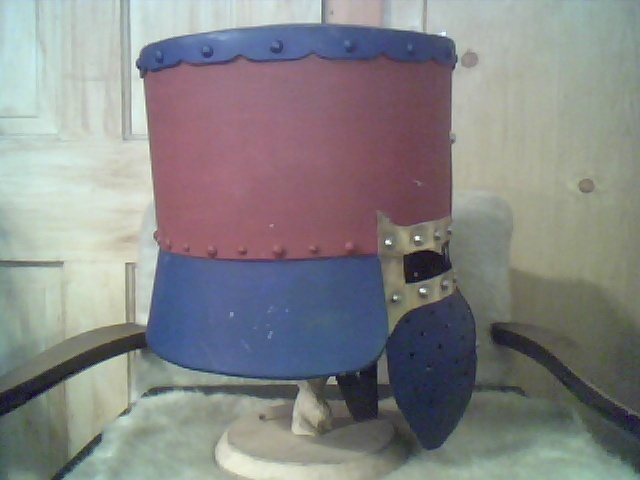 I have a great helm that I just could not keep the rust off of so I decided to paint it. I used the bead blast to remove the rust. I then used oil free compressed air to remove any dust left over from the bead blast. I then washed the helm with a mild detergent to remove any left over oil from the surface, towel dried the helm very thoroughly and then placed the helm in our cold oven range over night. This is an excellent place to remove moisture from something if you need it very dry. For paint I went with a modern approach and used Rust-oleum primer for the base paint, putting on three thin coats over a period of three days. I then used a permanent, water based, all purpose acrylic paint that I purchased from our local hobby store. 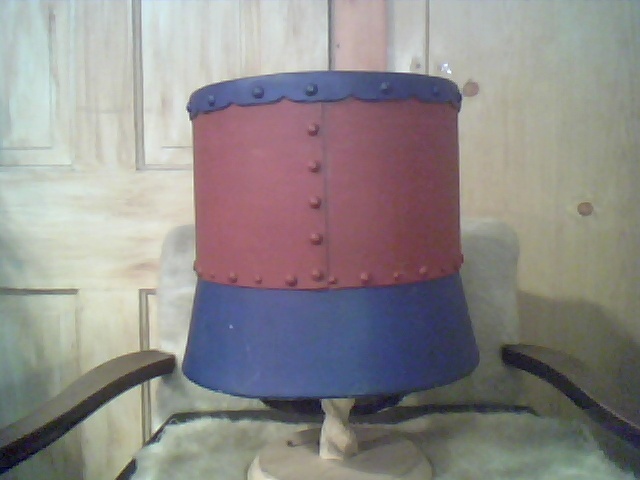 My finished colors were Maroon and True Navy Blue and both colors were in a flat finish. I used a white primer for the base color for two reasons. First it allowed me to put on thing even coats of the acrylic paint because it would show through the coat and this enabled me to see if I had any thin or heavy areas of paint. It took four coats of acrylic to completely cover the white primer which I applied over a four day period. The second reason for using a white base is it will actually brighten up the darker color you put on top and since I was using a flat finish with my colors I wanted that little extra brightness to my finish. This combination has stood up very well so far and I have gotten some very good comments on how the helm looks. I am having some problems with my computer and am unable to include any pictures with this post but will try to add some pictures later. I have some pictures of the helm I described in my previous post. I hope that they come out OK. I am not exactly a computer person. As you can see there is some scratches on the helm but overall it has held up quite well. Regardless what method or paint you choose to use, Good Luck and I look forward to seeing pictures of the completed project here in the future. 1) Pay special attention to cleaning and degreasing before you proceed to the actual painting. 2) I don't think that primer showing from underneath the main color is good. So either use primer of same/similar color or find the paint that will stick without primer. 3) There is no paint (at least none that is readily available) that would withstand a hit with a sword. To avoid large flakes of paint chipping off use thin layer of paint. Or use paint that stays somewhat soft even when completely dry. 4) Buy some rust protection spray. This stuff gets everywhere (including pores in paint) and creates a protective coating that keeps moisture and oxygen away from metal. I don't know how it will work with "natural" paints but at least the one I have is safe for most modern paints. Preferably spray the stuff on new scratches as soon as possible. As an alternative to rust protection spray you can oil your helmet often. If you use lineseed oil it will eventually dry and create a quite durable protective film. Considering that your helmet will anyway be scratched you should rely for rust protection not on the paint but on you habits of oiling your armor in time and keeping it away from water. Small jar of lineseed, olive, silicone or machine oil won't take much space in your car/backpack but may save quite a lot of time and effort. I still have one question: can I safely oil my helmet after painting and varnishing? Does it depend on the paint type used? I don't feel like patching up the paint work after every training session (besides, I don't mind the scratches) so I need some additional rust protection to prevent scratches from rusting. Most if not all modern paints intended for painting metal are oil-resistant. At least resistant to "neutral" oils such as any natural oil or silicon oil. I don't know about "natural" paints but I think that they will not be affected by these oils as well. After all how would you be able to apply another layer of oil paint if it dissolved the previous layer? And how would this paint withstand water which is a far better solvent than oil? Machine oil, WD40 and rust protection sprays can be more damaging to paint though. Paint your helmet as well as some extra piece of steel and then experiment on this piece, you should have no problem finding the oil that does not damage your paint. As said before. Use linseed oil paint. Simple to use, non toxic, no solvents and it can be repaired quite easily. Easier to re-paint a metal surface than wood since metal does not absorb the oil. For rust proofing you can just rub the inside wich linseed oil. It takes quite some time for it to dry completely but when it does, it hardens and gives a very good protection. And if it's scratched, just apply another coat! Just remember, apply it in VERY thin layers. Better with ten really thin ones than five thick. Also, remember that any cloth or rags, paper and similar vit oil on them (including the paint!) can self combust if not handeled properly. If you put them in a plastic bag, press out all the air ond tie it good so no air can enter and you're safe! For rust proofing you can just rub the inside wich linseed oil. It takes quite some time for it to dry completely but when it does, it hardens and gives a very good protection. And if it's scratched, just apply another coat! The inside of my helmet came painted black from the armourer. I'm worrying about the outside. Can I use linseed oil there as well? I.e. apply linseed oil over the oil paint so the metal under the scratches from sword hits won't rust? linseed oil over oil paint will be fine. the 'binder' of traditional oil based paints is linseed oil. a binder in paint is basically what the pigment is suspended in. modern day oil based paints will differ slightly in their composition of the binder but linseed oil will not hurt. your basically going to put a clear coat on what's already there, but linseed oil does take a long time to dry. now, if you were to paint using a water based product, the linseed oil will not adhere properly. a golden rule for paint is. water based paint can be applied over oil, but oil based products cannot be applied over water based. that has to do with the structure of the paint, oil based paints are very 'slick' in their chemical structure after they dry, which leaves nothing for the water based product to adhere to. on-the-other-hand, water based paints are much more porus, and will accept an oil based product after it's dried. this is why i recommend anyone that's painting anything - that if your thinking about oil paint stick with it, when in doubt, begin with an oil based primer because it will accept either water based or oil based paints. If you and the group you fight with do not require absolute historical accuracy, then rustoleum spray paint is probably the easiest option for you. 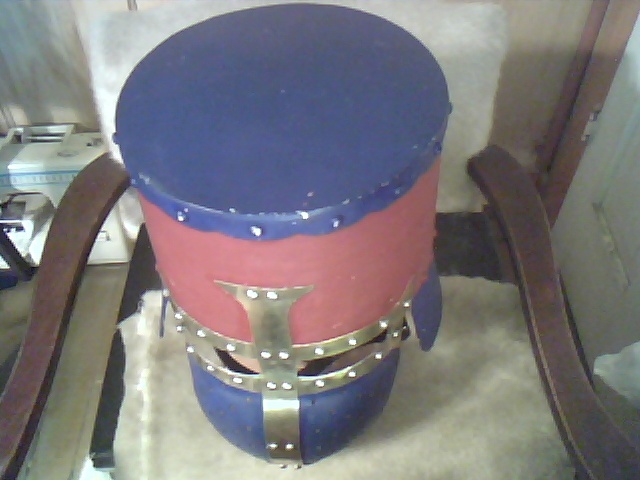 I have a great helm painted a matte red and its held up nicely for close to a year with one painting. Any paint will chip, but once the scratches get too noticeable, all you have to do is blast it again with another coat. 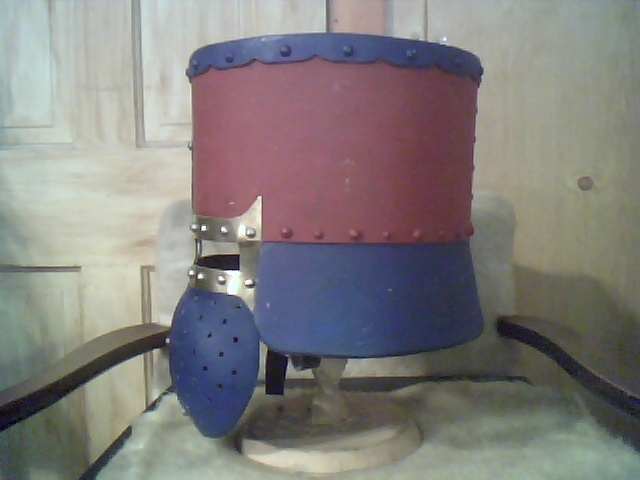 I haven't had to oil it once, and its stayed in good condition as the rest of my armor slowly rusts in my garage. As for the primer showing through: When I had primer showing through my top colors it was for just the first two coats of paint and helped me get the early coats even and thin. By the end of the third coat you could see no primer and after the fourth coat the color was even across the entire helm. For chip repair I use the same primer for any bare metal that is showing. I apply it by spraying some paint into a small container and applying the paint to the chipped area with a brush. This allows me to get the paint only where it is needed and eliminates over spray. After the paint has dried and cured I then cover it with the top color. Repairing chips in this way has worked very well for me. 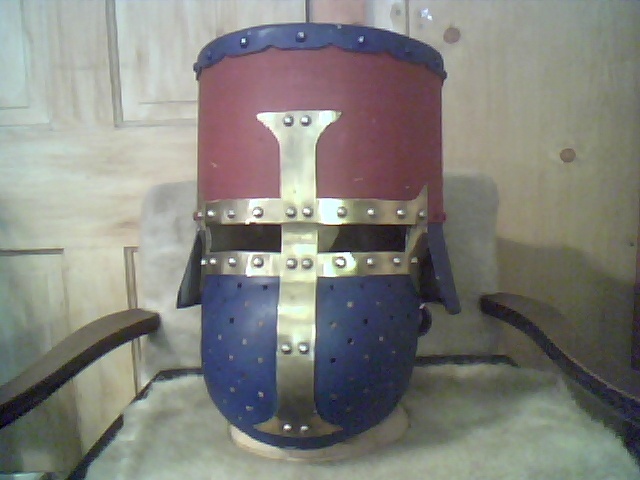 Also, I have not needed to oil my helm since I have painted it and I am not sure if oil would work for me since I used a water based paint for my top coats. However, if you use paint that would not be adversely affected by oils then it would be worth a try. Either way good luck with the project. Thanks for all the advice! I'll give some more thought to the paint I am going to use. I already have acryllic paint in the right colours (since I used it for my new shield) but I may go with oil based paint after all. Thanks again! you may just want to find a junker pice of metal to test out the paint and method you want before applying it. paint is kind of a personal preference thing. oil on the other hand, is fickle. if you use an oil based paint, just remember that thinner is better. if you'd go to a local hobby shop and pick up artist oils remember to get linseed oil with it (a home improvement store will have it at a better price though). you use it as well to thin the paint down to about the viscosity of ink. if artist oils are applied too thick they will crack during the drying process. the surface of the paint takes maybe a week to dry, but underneath its still curing and as the paint dries under the top layer it shrinks and begins to pull the top layer apart. in total, artist oils take weeks to months to cure correctly. if you'd decided on a rustoleum like we use in the states, it uses a different chemical binder i've never used linseed oil to thin it down - but the company recommends to use acetone. rustoleum is actually a wonderful paint. even without thinning it down, it will work really nicely without cracking and will dray in a few hours and take about 2 weeks to cure. rustoleum i believe if i remember correctly is a petroleum based product (not linseed like varnishes and shellacks) that's why it acts so must differently than other 'oil' based paints. You'd better not even try to unless you want to turn your paint into something absolutely unusable. Each paint needs its own solvent. By the way, oil (as well as any other) paint dries much faster in a warmer place. Lineseed oil on my armor dried in about 3 or 4 days when I placed the oiled pieces on a heater. I woud not use a thinner with linseed oil, firstl because there's no need for it and secondly ecause it's usually an unneccesary healt risk. Just put the oil aint on a radiator until it's about the right viscosity ou want. If you by artist oil paints (the small tubes) it's basically the best quality linseed oil paint. just squeeze out about a teaspoon in a glass jar (preferrably one that has a lid) and pour in a bit of raw linseed oil and stir to an even paste. Then just fill up with more oil until you get more of a "normal" paint. Keep it oxygen free and store it indoors where it's reasonably warm. It's not much more difficult than using acrylic but the result is way more satisfying!